I seem always to be dashing to the Distillery District, desperately hoping not to be late for some theatrical experience. It’s a shame because I hardly ever have a chance to actually enjoy the area. Thankfully, I made it to the Ernest Balmer Studio only a few moments late and found that the front of house staff had been holding the show for a few tardy individuals (of which I was one). 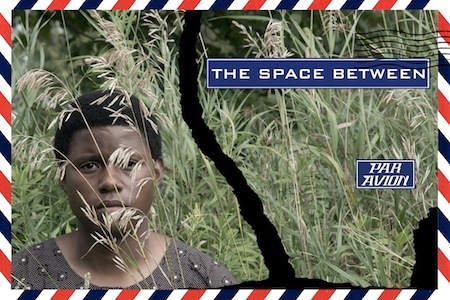 The Space Between is Simeon Taole’s debut as a playwright, but you’d never suspect as much. The writing is eloquent. It is full of warmth and insight into the heartbreak and joy of someone who has experienced and overcome adversity. This is the story of Winston, a boy who is separated from his first love—a girl named Celeste—when he is uprooted from his American home to live in Apartheid South Africa. The core of this story is the deep friendship between Winston and Celeste, and how it survives the “space between” the two of them. The story deals with a dark time in South African history, but it never feels burdened by the events it relates. Told so perfectly from the perspective of the young and growing Winston, the political and social climate becomes a rich backdrop rather than an exposé. The production features video projection used very sparingly. This is not what I would consider a multi-media show. The projections are used to enhance the atmosphere during key moments, but the focus is most definitely on Simeon Taole’s performance as Winston. Incredibly agile and expressive, he seamlessly alters his physicality to indicate the subtle shifts in Winston as he matures as well as the nuanced mannerisms of several other characters. What impressed me most was his ability to take us from quiet reflection, through shrieking terror, to intense jubilation without it ever feeling forced. Winston, while frequently disheartened by the circumstances of his life, never presents himself as particularly downtrodden. He is a determined individual, always moving forward, always looking towards possibilities. There is a gleam in his eyes that could almost be mistaken for naiveté; it is not, though… it is hope and awareness combined. Simeon Taole is an exceptionally persuasive performer. His text, voice and body conspire to create an overwhelming impression of the various environments that Winston inhabits. I was not fond of the incidental music that accompanied some spoken passages. It lent a generic quality to moments that were, aside from the music, anything but. I doubt most people would be much bothered by it; it’s just my particular sensibilities that are glaringly apparent here. I just felt his performance was potent enough to stand on its own. This is a one-man show that never feels like one of those one-man shows. If you don’t know quite what I mean, you likely haven’t yet become wary of this particular format. For those of you who do know what I mean, be assured: this show is not indulgent or sloppy. It is clear that Taole has lived with this character for a long time and is excited to be sharing him with us. I encourage you to see The Space Between. It is only playing until Saturday and it would be a shame miss this poignant show.